Believe it or not, nearly all of us have performed our first act of candle magic by making a wish and blowing out the candles. This birthday custom is based on the three magical principals of visualisation (end result), concentration (focus on blowing out the candles) and willpower (believing the wish comes true). Always cleanse your area before performing any sort of spell. Once you have cleansed your space, you’re one step closer to performing your spell. For the basics you will need to preform candle magic are a colored candle and a magical oil. To give an added boost, try carving magical symbols or names into the candle, as it can greatly improve the power of your intention. 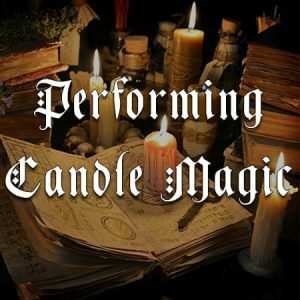 Other items such as incenses, loose herbs, ritual salts and crystals are placed upon your spell casting area to help magnify the power of your spell. To perform candle magic, make sure the candles you are using are virgin, unused. Never use a candle that has already been burnt for another purpose as it will contain vibrations from the pervious work. This can create a negative outcome for your spell. Weather it fails or comes back at you in another way, it is not something you want to risk. This doesn’t mean you can’t use the same candle for the same intention. Many spells require a candle to be burnt for so many days, in this case, the same candle can be used. All colours contain their own magical properties and harnessing the correct properties is imperative for spell work. Having the correct colour invokes that colour energy into the spell which helps to amplify your intentions to the universe. For instance, incorporate pink or red candles for love work or green for money and luck. Once you have the appropriate colour chosen, the next step is to anoint the candle with a corresponding spell oil. The purpose of anointing a candle is to establish a psychic link between the candle and you. By physically touching the candle, it starts to be charged with your own personal vibration. This helps to concentrate the desire of your magical intent into the candle making the spell powerful. Think of the candle as an extension of your mental power and energy. When you are anointing a candle for magical use, try to imagine that it is a psychic magnet with a north and a south pole. Start with one hand at the top of the candle and rub the oil downwards stopping in the middle. At the same time with your other hand, rub the oil from the bottom and stop in the middle. This motion draws energy in and is great for love and prosperity spells. To release or banish energy, start from the middle of the candle and rub outwards; middle to top and middle to bottom. Always rub in the same direction, never back and forth, as you are directing your personal energy into the candle ready for the universe. Like colours, herbs have their own magical properties that can aid you greatly when it comes to spell work. Once you have anointed the candle with a spell oil, roll the candle in magically corresponding herbs or powders to give an added boost. Be careful, if you have added oil and herbs, the candle can become a fire hazard. Make sure your spell work area is fire safe and that your candles are placed on a fire proof surface, free of flammable objects. As always, practice safe candle burning. Never leave a candle unattended or near anything flammable.